12% of responders to the Houzz & Home survey said their main reason for renovating was to sell their home. More than double, 27%, responded that their main desire was to customize a recently purchased home. As the millennial generation is getting older, they are buying their first homes. With their purchases, these new, young, homeowners are starting to affect the trends as they customize their new spaces. But, by large, the most common reasons for renovating are finally having the time and money to do the renovations. This is likely due to the increase in the number of people planning on aging in place. This phenomenon is picking up speed with younger baby boomers. While still physically able, people are beginning to change their homes so that if they require more accessibility as they get older and possibly have health issues, they are already prepared. Options like grab bars, higher toilets, curbless showers, and wider doorways are becoming more widely available in bathrooms while touchless faucets, lowered countertops, and more accessible storage are becoming popular in kitchens. These changes not only benefit those who are older or differently abled, but can also make life easier for families with younger children. The goals homeowners hope to achieve with their renovations are increasing the value of their home, enjoying their home more, and being able to stay in their home longer. The newest kitchen and bath trends are driven by new priorities. Younger homeowners are taking advantage of their tech savviness and incorporating smart technology into their homes and using the same technology to try and make their homes healthier, more efficient, and more environmentally friendly. Smart technology and more efficient designs make homes more functional and accessible for people of all ages and abilities. With manufacturers recognizing these trends, there are more options in recent years that allow for personal style to be maintained, but with increased functionality and longevity. Beyond that, there are always aesthetics to consider. In a recent Houzz survey, almost half of the people who had recently renovated their kitchen did so because they could no longer stand the look of their old one. Some changes are easier to make than others when deciding to update a kitchen. 95% of people in the same survey listed countertops as their primary upgrade. At Countersync, we fabricate and install solid surface showers and countertops. Our goal is to help our customers create custom spaces that fit their style and needs. We work to find the perfect fit for every customer. The reason we only work with solid surface materials like Corian and Hi-Macs is because we think it is the best product. Granite is somewhat falling out of favor and quartz may be on the rise, but solid surface is a unique mix of natural materials formed into a solid, non-porous surface that is easy to customize. 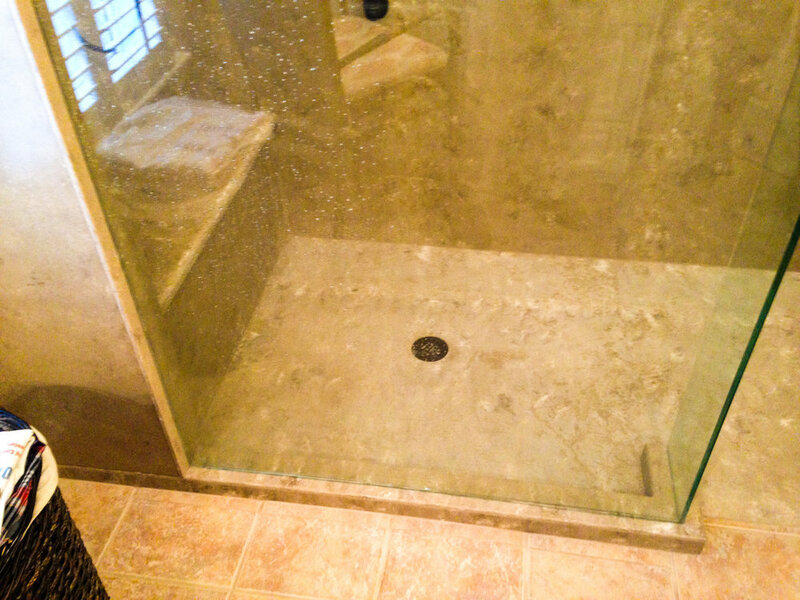 It stands alone among other shower and countertop materials in that it is a seamless surface that does not harbor mold or mildew or bacteria. It never needs to be sealed or treated and to clean it, you just use warm soapy water. Corian is celebrating its 50th anniversary this year and we’re willing to bet there are homes that still have some of those original colors installed and still looking like new. 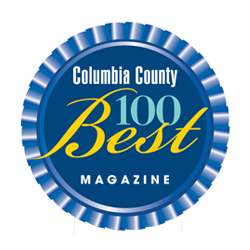 Solid surface is a durable product that we believe in, and in the process of installing it all over the CSRA, we’ve come to learn what our customers want from their showers and countertops, and beyond into what they look for in total bathroom and kitchen renovations. This eclectic kitchen features the stove prominently, surrounded by brick with wooden cabinets and a large stainless steel hood. This focal point stands out thanks to the lighter surrounding cabinets. Mixing materials can also mean mixing metals. Despite their color difference, this silver faucet and copper sink pair well together thanks to the wooden cabinet and floor and the neutral colored walls. A neutral room can be enhanced with accents of brighter colors to suit your style. Using colors in the white and grey families make rooms neutral enough that their design lasts longer, but are also easily customizable. Using white colors can give your kitchen and bath a feeling of cleanliness, and the addition of brighter accents can make the room feel less sterile. This bold kitchen uses a large checkerboard floor and neutral walls to help the green cabinets stand out. 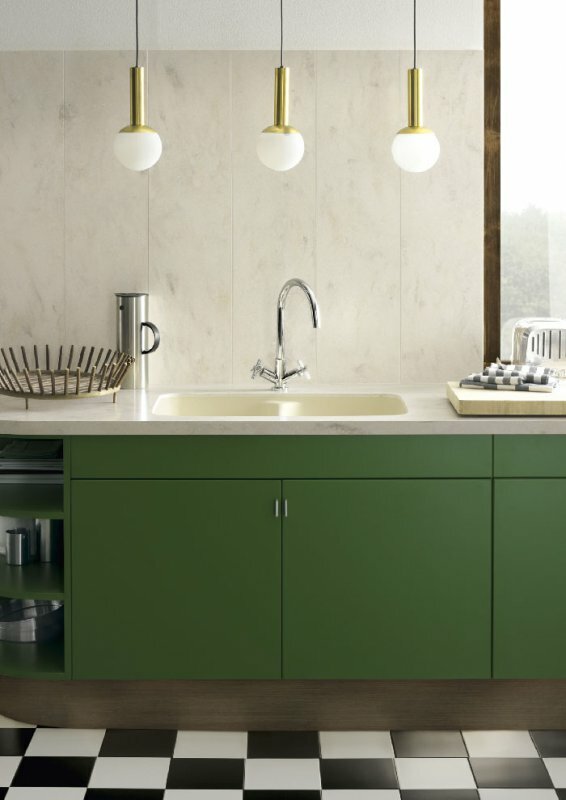 The use of color in this kitchen creates clean lines, which are another visually appealing trend. Using deep drawers in place of cavernous cabinets makes finding what you need easier and using handles instead of knobs increases the accessibility of the storage. 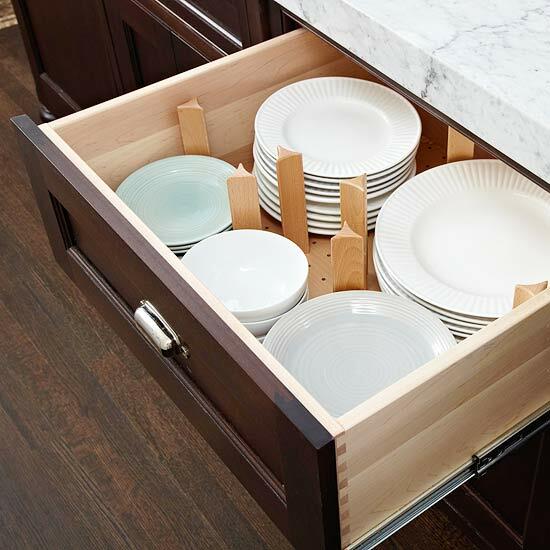 Plates and bowls can be stacked neatly and safely into deeper drawers. These newer deep drawers can also be customized to include smaller drawer inserts for smaller items. To store items of more unusual shape and size, pantry storage can be customized to fit your needs. Vertical slots make storage of cookie pans and baking sheets easier while squarer compartments can make storage of bundt pans and cake stands less of a hassle. Open shelves make everyday items easy to reach. This Corian solid surface island even includes a built in wine rack. Instead of hiding everything in large bulky cabinets, this bathroom has a more open feel thanks to its clean lines and open built in shelves. Instead of building a flat, two bowl vanity with storage only below, think outside the box to a set of drawers in the middle to help split up your space and give additional storage. This large kitchen is given a more relaxed feel thanks to its dark wood floor and beamed ceiling. This brick walled kitchen includes a large copper hood over the stove which serves as a centerpiece for the room. This kitchen in one of the new colors of Corian (Smoke Drift Prima), is given a more natural feel due to the movement in the countertop and backsplash and the copper elements surrounding the stove. Natural materials don’t mean less modern. This Corian kitchen includes wood flooring and cabinets as well as a butcher block island and stone walls. Clean lines can exist everywhere in your kitchen. This Kohler Purist faucet has a minimalist profile, a 360 degree spout, lever handles, and a higher clearance for pots and pans. 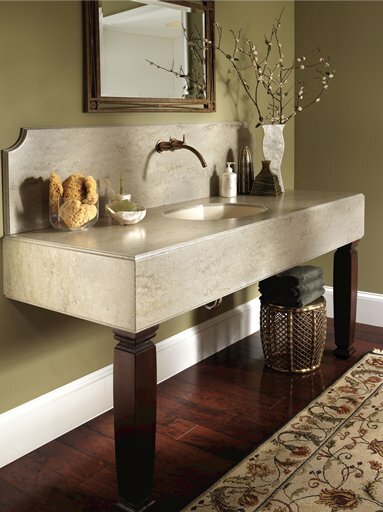 In use with the large farm sink, this faucet is guaranteed to make an impact. Clean lines help to create a more visually appealing room, like this Corian solid surface kitchen. In addition to the clean lines in this Corian Earth kitchen, the design includes some open shelves that are lit. This helps create more visual contrast and further the impression of clean lines. 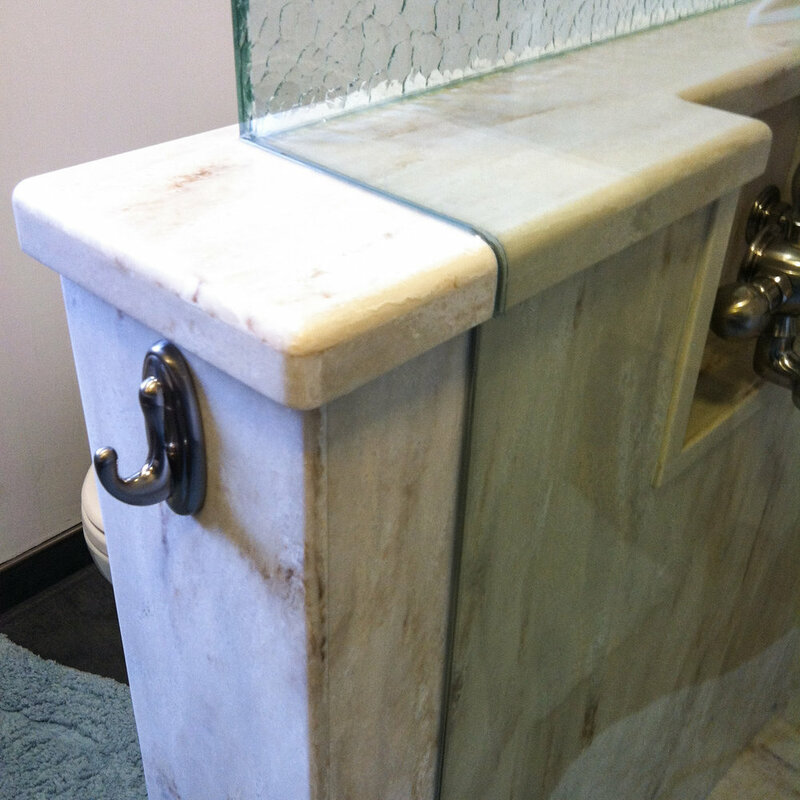 This solid surface vanity gives the impression of being larger than it is thanks to two supporting front legs instead of cabinets underneath. The long, wide front of the countertop and the exposure of the baseboard below create the clean lines in this bathroom. Lights under the cabinets help provide task lighting as well as creating a visually appealing kitchen. Induction cooktops are rising in popularity due to their ability to heat things quickly, their easy to clean nature, and the fact that their surface does not heat up as much. It is a more efficient method of cooking, as less heat is wasted going into the room. Under the counter microwaves are more easy to access, especially if they are made with a microwave drawer instead of a door. 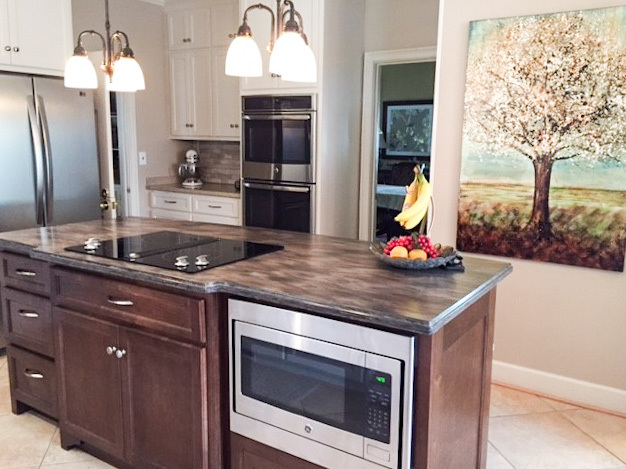 Stainless steel appliances are always favorites, but don’t shy away from other colors. Black appliances are becoming more popular. Millennials have pushed wine storage in the kitchen into popularity. 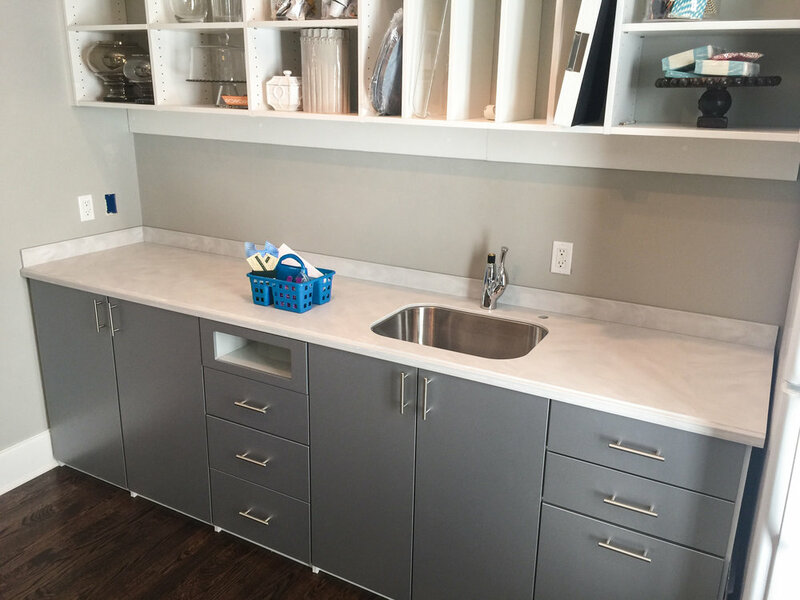 This Corian solid surface kitchen has a small wine storage unit built into the island. With more technology in the kitchen, there has been a need to increase the number of outlets and USB ports to accommodate all of the new technology. And with kitchens for younger homeowners becoming more multi-purpose, the need to streamline the technology is greater. Options for wireless charging are ideal. With Corian solid surface countertops, a feature can be built into your countertop to wirelessly charge your smartphone. Large tubs are on their way out and larger showers with accessible options are in. Lower thresholds and curb-less showers are the most preferred. 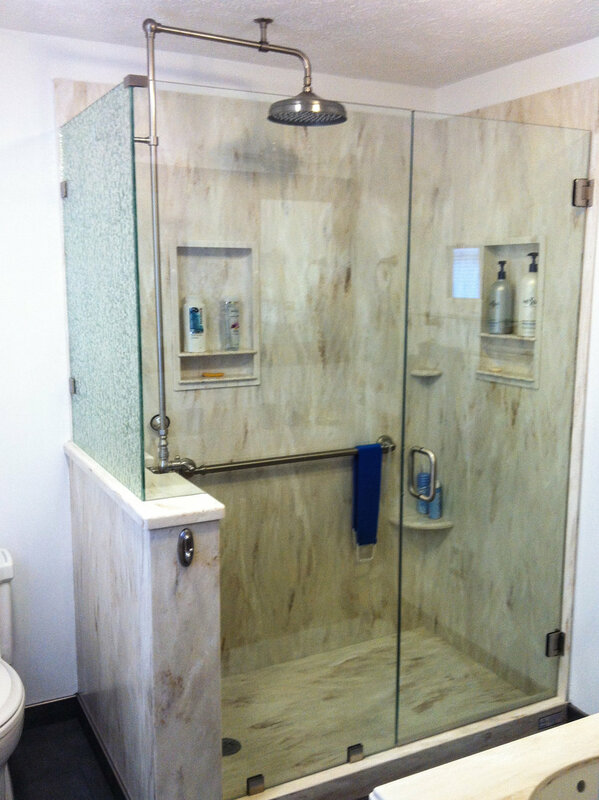 Curb-less showers work by sloping the floor of the shower or even of the entire room towards a drainage point. This allows the water to stay within a designated splash area and drain and dry quickly. 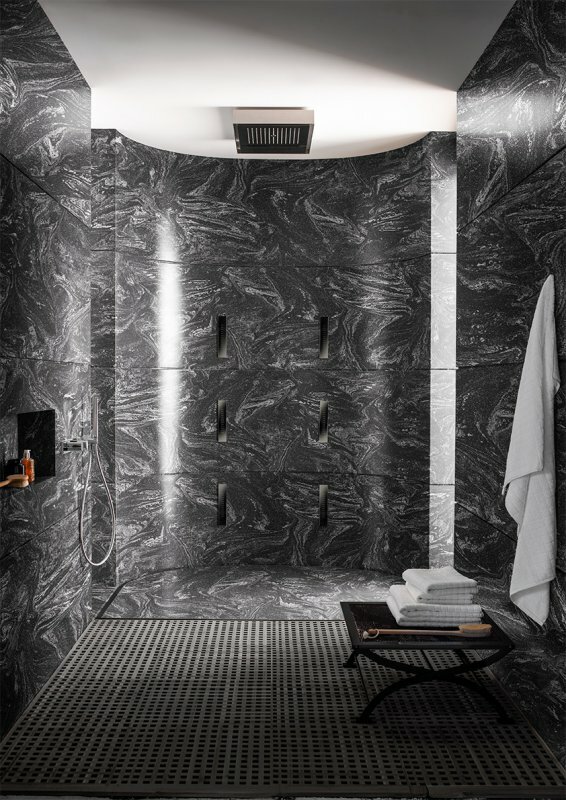 People increasingly want their showers to be spa-like as well as functional for everyone. No step showers, low threshold entries, grab bars, shower benches, handshowers, body sprays, and multiple shower heads make this peaceful goal possible. Homeowners are bring technology into the bathroom to increase this spa-like feeling with the addition of steam showers, programmable temperature settings, and water usage settings. Incorporating some of these trends will not only increase the value of your home, but it can help you live in your space more comfortably for a longer period of time.